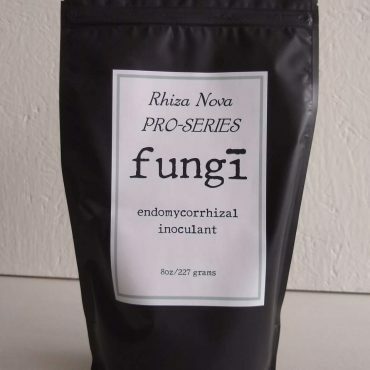 Rhiza Nova contains a blend of nine top types of Endo mycorrhizal spores – Glomus aggregatum, G. etunicatum, G. clarum, G. deserticola, G. intraradices, G. monosporus, G. mosseae, Gigaspora margarita, and Paraglomus brasilianum. Our spore count guarantee is a minimum of 50 spores per cubic centimeter. It is water soluble. This product can be used to coat damp crop seeds or can be mixed into water and conveniently applied as a drench to large areas of turfgrass, golf course greens, nursery seedlings, commercial vegetable crops, or bedding plants. It can also be blended into hydroseeding mixtures. 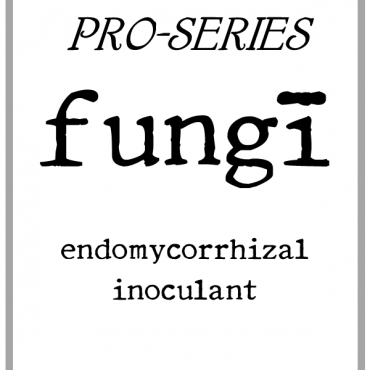 This is a general-purpose inoculant for all Endo-dependent plants, including most vegetables, grapes, fruit trees, berries, turfgrass, and flowers. 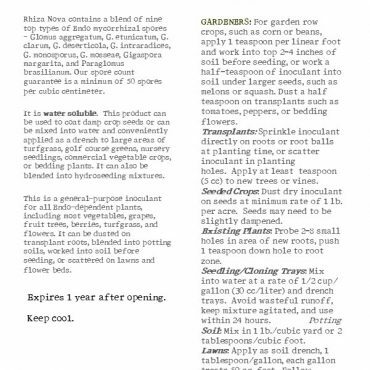 It can be dusted on transplant roots, blended into potting soils, worked into soil before seeding, or scattered on lawns and flower beds.